The idea of creating a community of political supporters is not a new concept (Vaccari 2008). However, the way in which the Obama campaign used social media to mobilize a historically difficult group (Rice et al. Social Science Computer Review, 31(3), 257–279, 2012), as well as the size of the resulting social media communities, was a new concept during the 2008 and 2012 presidential campaigns. Previous online campaigns had failed to effectively mobilize young adults, due to the political campaigners unsuccessfully translating the existing campaign formula, which focused more on older adult voters from the real world, rather than voters who frequently interact in the virtual realm (Vaccari 2008; Haynes and Pitts Symposium, 53–58, 2009). 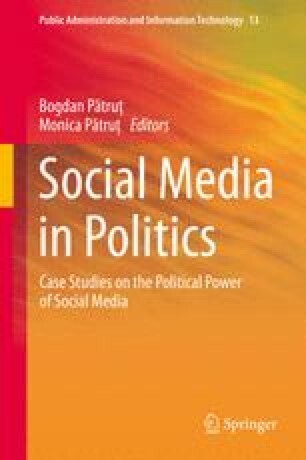 During the 2008 presidential campaign, Barack Obama’s team improved upon the strategies of the previous Internet mobilization campaigns, by placing great emphasis on social media (Godsall 2010; Bronstein Online Information Review, 37(2), 173–192, 2012). His online campaign deviated from the disciplined and traditionally structured format of previous Internet campaigns (Johnson and Perlmutter Mass Communication and Society, 13 554–559, 2010), encouraged the formation of online coteries among users (Bronstein Online Information Review, 37(2), 173–192, 2012), and facilitated civic political involvement (Fernandes et al. Mass Communication and Society, 13, 653–675, 2010). Obama re-built a sense of community assumed to have been previously lost (Jefferson-Jenkins, as cited in Dudash and Harris American Behavioral Scientist, 55(4), 469–478, 2011), and created a link between the lives of young adults and the election (American Behavioral Scientist, 55(4), 469–478, 2011).